Enjoyed chilled or warm depending on how you like it, the single serve BRAND’S® Essence of Chicken is priced at RM5 for a 42g bottle in selected FamilyMart outlets across the Klang Valley. The ten selected FamilyMart outlets are located at Damansara Uptown, KLIA2 Gateways (Arrival & Departure), Bandar Sunway, Amcorp Mall, Nu Sentral, MyTOWN, Scott Garden, Jalan Sultan, MyTOWN and Wisma Lim Foo Yong. So whether you want to fuel your mind and body at the start of the day, have a mid day boost or stay focused and energized when pulling in all-nighter, head over to the friendly convenient FamilyMart for your single serving of natural goodness. “BRAND’S® continues to innovate and expand our consumer touch points to meet their evolving needs and preferences. Our experience has shown that single serves are also popular in Thailand and Singapore and we want to bring this new channel to Malaysian consumers. We are excited about having our first single serve at FamilyMart and we plan to grow this concept of making it more convenient for our consumers to stay mentally and physically energetic all day,” said Kuang Ming Ming, General Manager of BRAND’S® Suntory Malaysia. 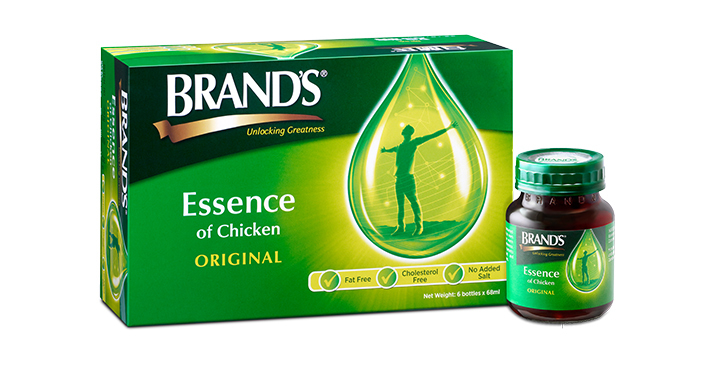 BRAND’S® Essence of Chicken is backed by over 40 international scientific papers and clinical studies and results have shown that regular/ daily consumption improves memory by up to 15% and enhances concentration by 22%, while metabolism can be increased by up to 16% to give the body an added energy boost. Clinical studies show that regular consumption of BRAND’S® Essence of Chicken not only improves one’s mental and physical performance while keeping stress at bay by reducing anxiety, mental and physical fatigue as it increases blood circulation and oxygen flow to the body and brain. For more product information and details, visit HYPERLINK "http://www.brandsworld.com.my" www.brandsworld.com.my, BRAND’S® Smart Living on Facebook or call BRAND’S® Customer Care Line at 1-300-228-300.